Above: Amy’s Take-Away Ensalada Mixta from 4 local farms — Story’s, RSK, Migliorelli, and Foxcroft, by Robert Sink, one of the entries so far in the 2015 Catskills Food Guide Photo Contest. As part of our 2015 Catskills Food Guide, which we're working on now, we're hosting a Catskills Food Guide Photo Contest, sponsored by the Peekamoose Restaurant & Tap Room in Big Indian. Photos of Catskills foods, farms, or food-related subjects are all eligible. The idea is to showcase the incredible bounty of our region. Winners will be featured in the 2015 Catskills Food Guide, and one grand prize winner gets a $75 gift certificate to the Peekamoose. These contests are always a blast. Spread the word! You've got exactly two weeks to email us the perfect shot. Also, since we're talking about the Catskills Food Guide: Buy an ad! Reach 20,000 readers upstate and in NYC, and support the Watershed Post. What's not to like? Share photos of Catskills foods and/or farms by 11:59 p.m. on September 16, 2014. Points for photos that include luscious close-ups and bright colors. Humor and originality are always excellent, too. Submit your photo before 11:59 p.m. on Tuesday, September 16, 2014. Only one entry is allowed per person. Winners will be chosen by November 25, 2014. One grand prize winner gets a a $75 gift certificate to the Peekamoose in Big Indian. No purchase is necessary to enter or win this contest. Contest begins on Tuesday, September 2, 2014, and ends at 11:59 p.m. on Tuesday, September 16, 2014. To enter, you must be 18 and live in New York State. To enter the contest, email a photo to [email protected]. Limit one entry per person. Odds of winning depend on the number of eligible entries received. Contestants grant the Watershed Post and the Catskills Food Guide the right to publish their photos and their names in print and online. Entry must be the original work of the contestant, must not infringe upon the copyrights, trademarks, rights of privacy, publicity or other intellectual property or other rights of any person and must not violate any law. We reserve the right to disqualify any entry for any reason. All entries will be judged based on judges’ determination of creativity, wittiness, and beauty. The top scoring entry will be declared the contest winner. The prize — a gift certificate to the Peekamoose Restaurant & Tap Room in Big Indian — is worth $75. The winner will be notified by email by Tuesday, November 25, 2014, and will be provided with instructions for redeeming the prize. 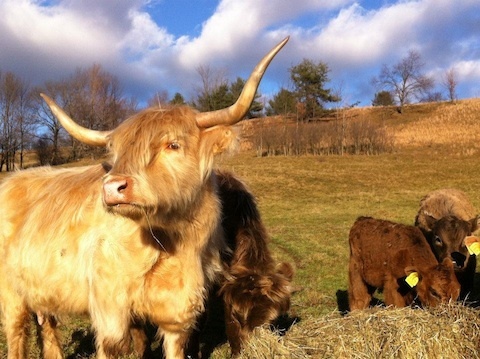 Below: Cows in winter field at Stone & Thistle Farm, by Denise Warren, the first-place winner of last year's Catskills Food Guide Photo Contest.